Not an unusual sight this time of year. I’m not complaining, but does this seem a little odd? The sign on Elm Street in the block occupied by Albany General Hospital prohibits parking on the curb, presumably to keep the bike lane open for bicyclists. But blocking the lane with piles of dead leaves is OK? This is not exactly rare this time of year on Albany streets. The bike lanes are often full of mountains of dead foliage. But it can’t be helped. 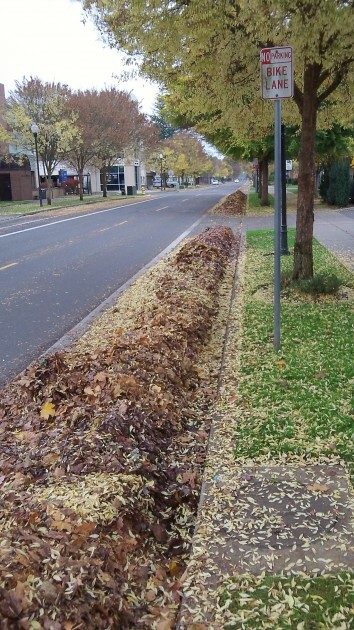 This is a Tree City USA, and fall produces far too much in the way of fallen leaves to fit in the yard debris containers that Republic Services picks up ever other week. Chuck Leland commented by email: Seems to me that a bike, riding in the street, is much more at risk from cars than a pedestrian is at risk from a biker on the sidewalk. I recall seeing a biker receiving a ticket from a policeman (don’t ask where or when) for riding his bike on the sidewalk. No one walking within a few blocks. Yet I believe Segways, those two wheel, gyro balanced riding devices that go several miles an hour without pedaling , are legal to ride on sidewalks? I could be wrong about this but somewhere I’ve been recently allows this. Finally, I feel bikers are more alert and concerned about what’s around them than many auto drivers. Ahh, the joys of unintended consequences. We were ordered by the city to rake leaves into the street at least two feet from the curb in long, narrow rows. Just like your photo shows. Veering into travel lanes is a risky move for a cyclist. Drivers haven’t been properly instructed by the city on what to do in response to a veer.